Finding the best golf cover doesn’t have to be a challenge. You’ll need one so that your cart stays clean and dry during the winter months while it sits in storage. At the same time, you don’t want the interior getting soaked from rain or moisture. This can cause damage to your cart’s upholstery or worse, become a hotbed for mold and mildew growth. Below are three of the best covers currently available on the market. We’ll go through each one and give you our final verdict on which one out of these three are the best of the best. The Himal Golf Cart Cover is suitable for golf carts that can contain up to four passengers. This cover is made from high-strength polyester fabric, which makes it very durable and stronger when compared to other golf covers. Not only is it durable, but it also is waterproof. The cover is coated with a PU waterproof layer to enhances overall water resistance. To top it off, it has an exclusive waterproof adhesive tape in the stitching area. The double layer also protects the cover from water leakage. The cover is also sun-proof. 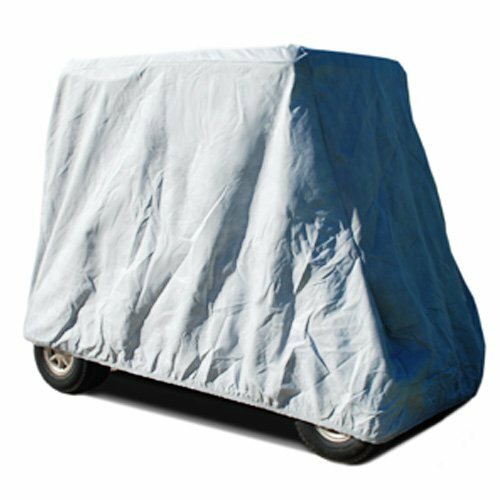 The silver coating of the cart cover can effectively prevent sunlight from aging your golf cart. This also has four grommets that are designed to dissipate heat, ventilate, repel moisture, and keep out dust and insects. This also has a Velcro strap that can double secure the bottom of the zipper. Finally, this comes with a 1-year warranty. 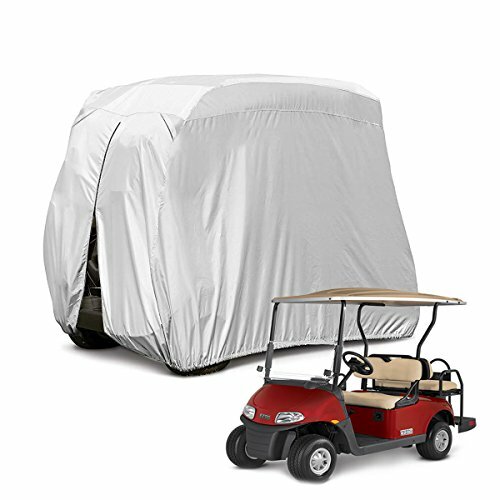 You will enjoy first-class customer service each time you need it when you purchase a Himal golf cart cover. To begin, it should be noted that the CarsCover golf cart covers are currently available in three different measurements – 95, 115, or 132 inches in length. Like the previous cover, this is large enough to cover a 4-passenger golf cart. If you also need one to cover up something like an antique vehicle while it’s in storage, why not get two? This is a heavy-duty 5-layer storage cover that is not only waterproof but can also protect your cart from all kind of weather – rain, wind, snow, or sun it doesn’t matter – you’ll want to protect your golf cart the best you can. One thing you’ll want to protect is your cart’s interior, especially from potential water damage. This cover will ensure that no water leaks in through your cover. This way, your upholstery won’t get soaked or have any mold or mildew growth. To ensure that your golf cart does not age prematurely, this cover has a UV stabilizer known as REMAFIN™. This will ensure that the sun will not damage your car’s exterior. This also has elastic located in the front and back with buckles and straps attached. Once you uncover it, it can easily be put away in storage. 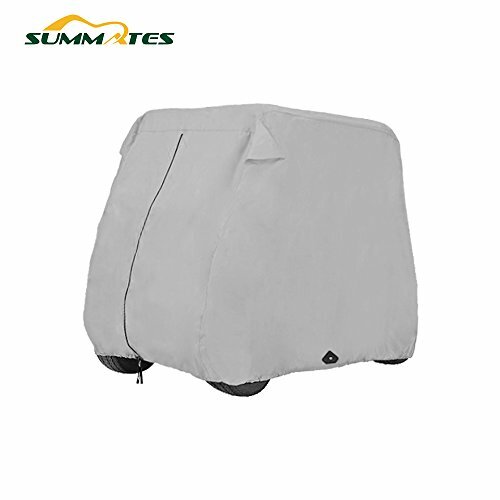 Finally, we have the Summates Golf Cart Cover. This comes in three different colors and is available in two sizes. One will fit two-passenger golf carts while the other will fit on most four-passenger carts. You can easily wrap your cart with this cover and easily uncover it when it comes time to head out on the course. You’ll get easy access by way of the rear zipper. This also has air vents in the back to ensure that it reduces wind lofting and prevents moisture from building up on the inside. Having no moisture inside will mean your cart will be safe from mildew and mold growth. For a snug fit, this cover has an elastic cord that is sewn into the hem. It may be tough to choose one or the other when you have three choices in front of you. Each one has their best features and a few shortcomings. But if we had to choose one of out the three, we would choose the CarsCover golf cart cover. If you want a cover that will fit perfectly, the CarsCover has it available in three different lengths. Plus, it has all you’ll ever want in a cart cover – protection from nature’s worst, preventing your cart’s exterior from sun damage with a patented coating, and easy access to your cart’s power cord for when you need to charge it. How Long Does It Take to Charge a 48-Volt Golf Cart? We are a participant in the Amazon Services LLC Associates Program, an affiliate advertising program designed to provide a means for us to earn fees by linking to Amazon.com and affiliated sites. Golf Cart Go also participates in affiliate programs with Bluehost, Clickbank, CJ, ShareASale, and other sites. Golf Cart Go is compensated for referring traffic and business to these companies.